Earlier this session we posted about the planned family learning work in the Culloden ASG through the support of High Life Highland libraries. In January, following being awarded funding from the Scottish Library and Information Council (SLIC), Read to Succeed is now expanding into a Thursday evening, 7pm – 8.30pm. Michelle Gowans, Network Librarian, would like to extend a welcome to Highland teachers as a career long professional learning opportunity. Thanks to Michelle Gowans, Network Librarian (Culloden) for sharing the following. The High Life Highland Library Service, through their Network Librarian, Michelle Gowans, and the schools in the Culloden Academy ASG, are going to be working collaboratively this session to develop family learning through the ‘Read to Succeed’ initiative. 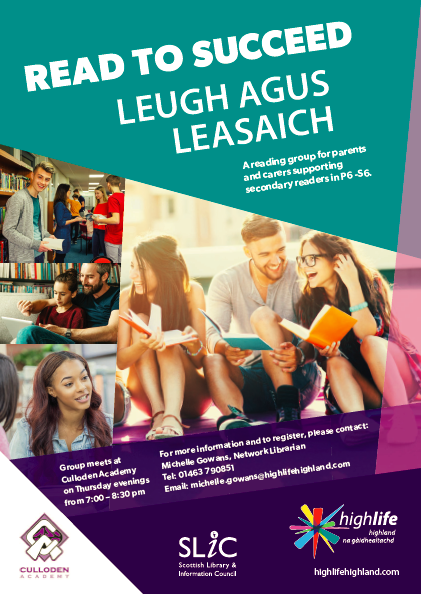 With families from P6 – S6, a book group is going to be created. Unlike book groups with young people, the book group is for parents who have children in P6 to S6. There is no preparation required out with the book group; the texts will be explored during the sessions. The books will be teen fiction, exploring issues which young people are interested in. The core aim of the book group is to promote reading within the home environment, hopefully sparking off discussion in the home around the texts which are going to be explored. This entry was posted in Uncategorized on December 7, 2018 by Mr Cook.